Chief Eye Surgeon Pavel Stodůlka has operated on a number of members of the infamous Vienna opera. The last of them was the tenor singer Roman Lauder. The Gemini Eye Clinic in Vienna and the Vienna State Opera are both located on the same address of Opernring. Several members of one of the most well-known operas have already visited Dr. Stodůlka and his clinic to liberate themselves from glasses and contact lenses. Lately it has been] Roman Lauder, the tenor singer. The singer is now after diopters and without any troubles. He is satisfied. 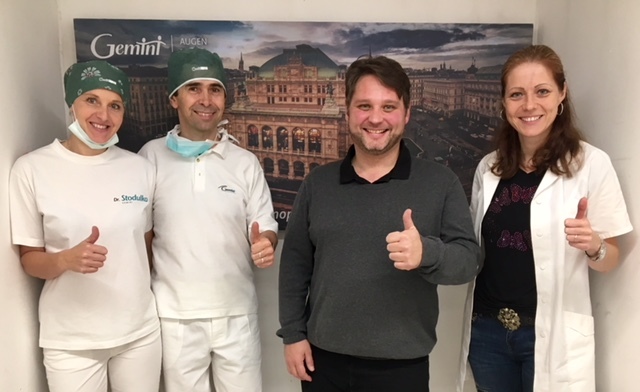 After the procedure, the tenor singer had a picture taken with the Gemini stuff – the surgeon, the ophthalmologist, and the nurse who take care of all our Vienna clients.